Header means this is not really a guide, just a brief description of what the build ended like, and how, and why. This is a strong build, perhaps not at the level of some broken builds of TQIT time, but not some elemental hybryd weirdo like they used to be in TQIT time either. Hunting has some very useful things for an elemental attack build, first of all flush out which makes dealing with 60% all resist monsters have in legendary simpler. Then also volley WPS and wood lore passive. Overall, hunting does not have much for elemental build however, being focused on piercing, there is also herbal remedy, find cover and that's about it. 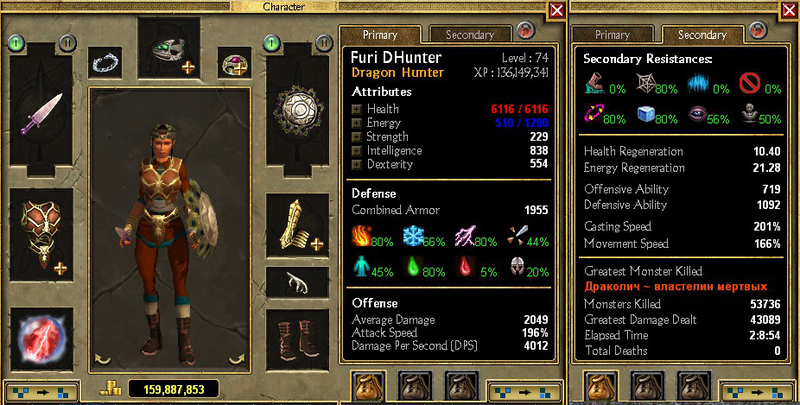 Because of that, dragon hunter is almost all about rune mastery, and takes every skill there, except guardian stones. This is essentially an elemental attack build with spells. It features capped run speed, almost capped attack speed and very high cast speed to be very nimble. It relies on using skills or just outrunning foes rather than facetanking. Stats are 1 : 1 dex : int all the time, this is a dexterity/intelligence hybrid like nothing that used to be common in IT. 7 quest rewards, or 14 points, go into energy, mostly for energy armor sustain. I started it as a developed character at level 40 to avoid dealing with gear and stat issues a hybrid may face at early levels. It should be bossible to level it from level 1, starting as rune and relying on flat elemental damage gear for damage and +strength gear for requirements. 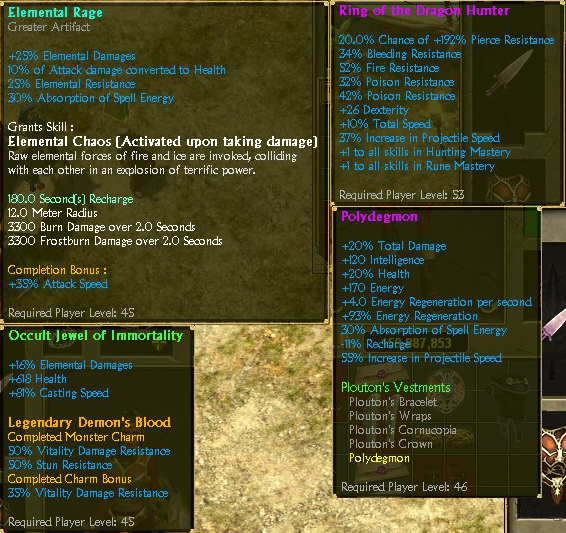 Items like storm eye epic ring and rares with "electrified of frost" or similar rolls. Flat elemental damage on throwing weapons, bows and spears, with Zeus thunderbolt for even more flat elemental. That should suffice until the end of normal when rune weapon gets enough points to matter. Rune weapon skill except energy drain, runeword: feather and wood lore are maxed first together with masteries, everything else is at 1 pt. 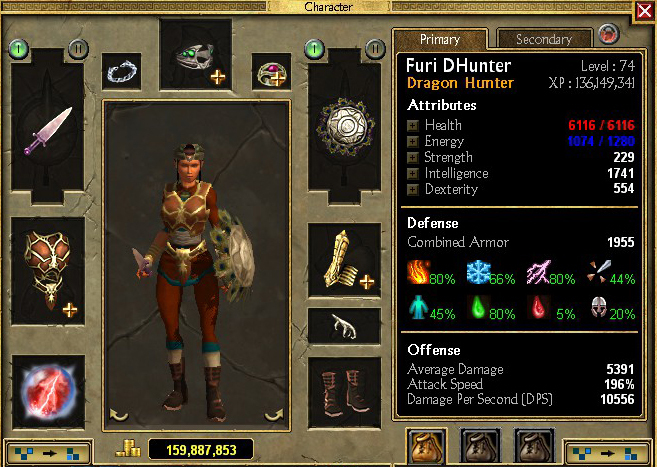 Then resistance skills, rune of life and herbal remedy, and flush out for debuff. Next rune mastery spells in any order, I started with seal of fate for nuke and runic mines for fun and utility, but it can be thunder strike instead. Energy drain and Menhir wall are left for the last. Energy armor is leveled cautiously, for its price to not exceed available mana pool. 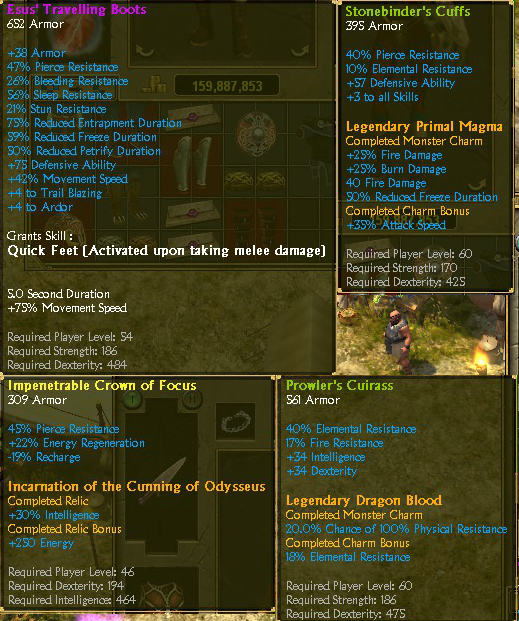 Build has leftower points when using blessing of the Moirae weapon, these can go in study prey, trail blazing and art of the hunt, however, these do not benefit the build itself and may only help other people in multiplayer. Most of these legendaries are improved by Durinn and Dvalinn, some pretty impressively. Armor - prowler's cuirass with dragon's blood - this is still a very solid chest for resists which can be enchanted with relics. Dragon's blood relic in chest is debattable, 20% chance of 100% resistance is not the same as 20% resistance of course, but since hero mostly takes that damage in many hits it helps a glassy character with low DA anyway. Dragon hunter's ring has more of that, but for pierce. Dragon's blood competes with Golden fleece here which could have made energy armor much more sustainable. Hands - Stonebinder's cuffs with primal magma - together with dragon hunter's ring grant +4 all skills so these aren't needed anywhere else on gear, freeing up some slots for other stats. Helm - common item with impenetrable of focus with cunning of Odysseus - just something with recharge and a resist, and cunning of Odysseus relic for dps that can be replaced with some resist relic if needed. Feet - Esus travelling boots - are mostly for resist, that extra movespeed proc isn't necessary, its already capped. Shield - Hera's shield is there for hp, resist, and its minor debuff, though it also has str/dex/int that can help with stat requirements. Necklace - Polydegmon - is one of the main DPS boosting items. Build puts lots of points in dex to use stonebinders, then gets missing intelligence from items like this one. Build also needs good energy regen and luckily Polydegmon has just enough, together with 80 int (+40 from legendary craftsmanship quest). 2nd ring - Rare ring with occult prefix and demon's blood - is a way to get decent cast speed. Main weapon - Blessing of the Moirae might be a BiS weapon or one of the best available. Spear is just something with flat damage picked along the way, used only against shadow lurkers, nixie and some mobs at Iggdrasil. Out of scrolls, scroll of the sun blessing adds 150 flat fire damage and by that increases displayed DPS by 1,5. Primordial chaos also has flat elemental, but also % total and 40% damage absorption which is the same as "all damage taken reduced by 40%". Legendary frost nova can be used for utility. Normally this build does not need these extras, but in late legendary act 5 something like sun's blessing can speed up the process. Focus is magic and is from 16 or 17% to 19%. Rumination is around 13%, and there is another one around 8% which I do not remember the name of in english, common in normal. Out of rare ones there is magi with 15%.